Celebrity encounters is the topic of this week's Modern Family, as the family members remember when they met various celebrities. 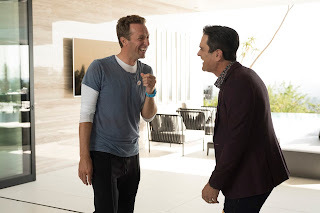 Phil gets to show a house to Chris Martin of Coldplay, which he is of course very excited about. However, he starts having groin pain, which disrupts his showing of the house. He tries to ignore it, but ends up passing out. At the hospital, Phil discovers that Chris Martin is still there, which he likes at first, but he soon starts to become annoyed with the lack of privacy he now has. But things become alright for Phil when Chris Martin sings the song that Phil wrote. There is also a very funny ending, where the doctors and nurses ignore patients. Mitch and Cam see the host of a gardening show that they watch, and they try to get him to offer to improve their backyard. They remember that couples on the show often have conflict, but they suddenly can't stop agreeing, which serves as a funny commentary on how often Mitch and Cam bicker on the show. Their obvious staged conflict is funny, and it's great that it goes further, with Cam actually ending up offended then the couple having a sincere moment. The end of the story is also great when they confront him, and at the end get mad at him, when he doesn't say yes when they ask him if he would pick them if he still had the show. This was a great story to bring Mitch and Cam together for a common goal, and it had funny moments. Jay quickly goes from trying to get out of jury duty to embracing it when a football player he really likes joins the jury. This contrast is great, but the story gets better. Jay behaves like a schoolgirl with a crush, which is very entertaining and different than how we usually see Jay behave. Of course, his obsession leads to him offending the football player, and later he gets removed from the jury. However, things weren't all bad for Jay, as the restraining order he is given has the football player's signature on it, which is very excited about. While Manny and Gloria are at a diner, Manny sees a playwright that he is a huge fan of. He goes to the playwright's table, but he is rude to him. This obviously angers Gloria. Manny tries to keep her from confronting her, but he ends up being unsuccessful, which is very funny. There is an ironic ending, when Manny and Gloria realize how the playwright must feel when people approach him, but aside from this and Gloria distracting Manny, there isn't that much that's entertaining about this story. While certainly not one of Modern Family's strongest episodes, it is one of the show's strongest recent episodes. I haven't been that impressed with the show as of late, but, while this episode wasn't outstanding, it entertained throughout. Manny and Phil's stories were okay, but Jay and Mitch and Cam's stronger two stories made up for it. What did you think of "Brushes With Celebrity"? Leave your thoughts in the comments!